It’s funny how there’s inspiration all around us. 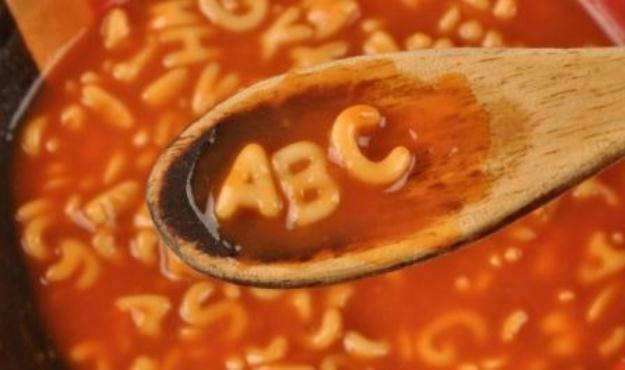 What were once just the chunky, chewy bits of edible alphabets floating in my bowl of tomato soup, have tonight become an inspiration. Such trivial phenomena exactly emphasize one of the biggest notions of life. Enjoying the littlest of things. An incident that had occurred a while ago will help give some gravity to what my words are trying to convey. A friend of mine once posted a picturesque photograph of a pizza, at an angle that portrayed it as the most magnificent piece of photography on earth, besides probably being the most tastiest piece of pizza on earth. There was a quote that accompanied it, that went -‘Someone taught me how to enjoy the little things in life’. When I came across the picture, remarking how simply true the quote was, I asked her who that ‘someone’ was. My friend laughed and ribbed me about how I had just about the same memory span as that of Dory. When she told me that it was indeed I who had said this remark, I had two thoughts on my mind. One, that I needed to be more cautious of the things that I say so that I don’t look like a lost squirrel through conversations. The other far more profound one, the fact that my friend had remembered such a casual remark of mine just instantly elevated the ‘appreciating the little things’ fact way higher in my mind. It was an explanation to itself and made me boundlessly happy, thus strengthening my mental optimism quotient. Here’s to this little spur of inspiration to express my gratitude and gratefulness to everything that I have. To be more precise, here’s to the little things. A new day, a new opportunity, everyday. Books. They’re uniquely portable magic. Chicken. My self-esteem just went down a notch by including this in the list. But denying that it is one of the tastiest food that I have ever eaten would be more than difficult. Daylight. As much as I love the dark, daylight has a sense of safety like nothing else. Energy. The life and energy that keeps me up to do what I do to my best. Finding things I’d lost. Finding new parts of myself. Finding my people. And holding on to all of them. ‘Glow in the dark’ stuff, because it is a living example of the hope that even in the gravest of darkness, there is always a light of belief and glee. Home. An irreplaceable space with an ambient aura of its own. Idiosyncracies that make you you-er than anyone else. Jokes, because laughter is indeed the best medicine. Keys. For when you want to lock away to keep security, or open up to warmly welcome someone/something to your space. Notebooks and papers, that allow you to vent all the ideas, thoughts and inventions in your head and give them a concrete form. Photographs. The embodiments of the essence and memories that enable them to be preserved as such. Quiet time, away from the hustle-bustle of everyday life. Rhythms, songs and melodies that provide as an array of songs for every mood. Senses of touch, smell, taste, hearing, and feel. The Daily Post, for this amazing idea. Uncertainty and unpredictability of occurrences. Victory run. When you have a goal to reach. X. To distinguish the wrong from the right. Yesterday, for being a lesson learnt or a memory worth revelling in. Zzzz. Sleep, because it’s eternally pleasing. What are you grateful for? Remember to look closely, because the little things turn out to be the most eminent ones at times.